The holidays don’t have to be difficult…Outdoor lovers are easy to please; simply give the gift of adventure this year! 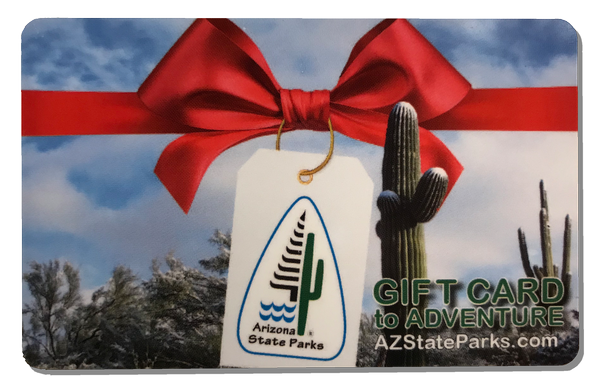 Arizona State Parks and Trails has Gift Cards and Annual Passes available for those hard to shop for outdoorsy friends and family members who also happen to love spending time in nature. Give a gift that keeps on giving, all year long! 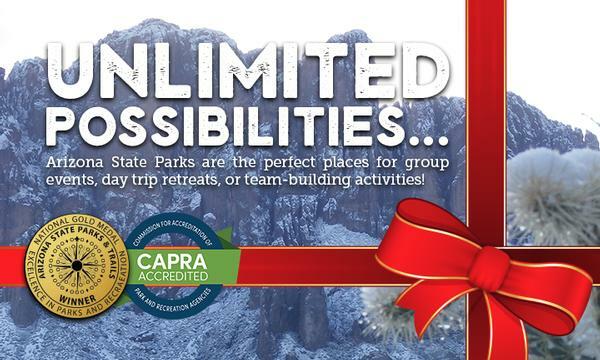 Arizona State Parks gift cards and annual passes are designed to continually provide excitement, entertainment, and adventure throughout this amazingly beautiful state. By providing this level of of stimulation for your friends and family, your gift will be forever remembered as one that substantially impacted the life of someone. Holiday parties can only be great within the perfect setting. Goodfellow Lodge at Tonto Natural Bridge State Park is just the place to make holiday memories. Family retreats, corporate parties, and holiday escapes for large groups are perfect for a stay in this beautiful historic lodge in Arizona's Mogollon Rim country. Gift cards are a great way to share the beauty of Arizona's open spaces for those "hard to shop for" types that love the outdoors. Use cards for state park day-use, overnight camping, cave tours or park store purchases at state parks across the state. Cards may be purchased below using our secure online portal or at select state park offices across the state. Online options include $25, $50 and $100 denominations. Gift cards purchased at park office locations can be purchased for any denomination, up to $500. The annual day use pass allows access for up to four people to state parks across Arizona. A day use pass opens the door to exploring every corner of amazing Arizona — perhaps experiencing a different location each weekend. History lovers can explore the stories of the past at the state historic museums. 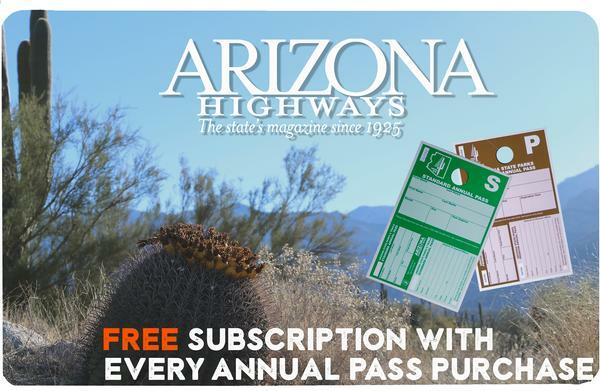 Plus, with every purchase of an Arizona State Parks & Trails annual pass, you will receive a free year-long subscription to Arizona Highways magazine. 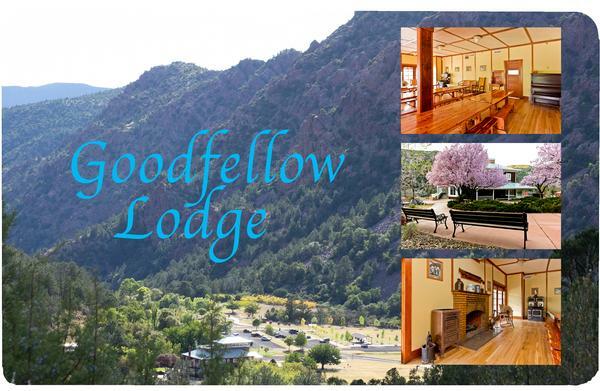 Goodfellow Lodge is situated within the stunningly beautiful Mogollon Rim country of Payson, Ariz. Corporate retreats, family gatherings, and holiday getaways can all be hosted in this historic, yet fully functional, lodge in the pines. The lodge has 10 furnished bedrooms with private and communal restrooms, beautiful wood cabin group dining area, and a large kitchen big enough for your group or catering company. Or, entertain on the outdoor veranda or the grass event area outside. It's up to you! It’s no secret, Arizona’s weather during the next several months is going to be fantastic! It’s finally cooling off in the desert parks and hiking season has hit full stride. Wintering birds have returned to enjoy the relatively mild season and offer patrons a chance to see the winged beauty of these seasonal visitors. During this season, anglers shift their focus from bass and catfish to delicious trout at Dead Horse Ranch, Patagonia Lake, and Roper Lake state parks as the Arizona Game and Fish department loads these destinations with plenty of rainbows to go around. Parks have begun to cool off considerably throughout the state, but that doesn’t mean you can’t enjoy the blustery high country from the comfort of a heated cabin rental. Seven parks throughout Arizona have comfortable cabins situated near lakes, among trails, and amid the beauty of your Arizona State Parks. Cabins sleep up to six people and come equipped with a fire ring, a grill, and outside seating in addition to the fully functional interior. For larger groups, you can enjoy the parks under a group ramada! The ramadas offer covered seating and tables for up to 40 people, a great venue for holiday gatherings! You can enjoy the outdoors and celebrate the season no matter the size or scale of your get together. Your parks have endless options for festive feasts, gatherings, and parties! Take advantage of Arizona's gorgeous fall and winter by spending it outdoors in unique venues! 2nd Sunday of the month, October to May 1:00 p.m.
3rd Sunday of the month, October to May 1:00 p.m.